Toronto, Ontario, March 9, 2018 – Taiki Morii is not your average Toyota employee. In addition to his day job working in the Government Affairs Division of Toyota Motor Corporation, which he started from August 2014, Morii, a three-time veteran of the Paralympic Winter Games, is aiming for gold at the PyeongChang 2018 Paralympic Winter Games, representing his home country of Japan in the alpine sit-ski event. The sit-ski is a bucket seat suspended above a ski that allows the skier, Morii in this case, to maneuver through turns on the alpine ski course using his upper body and outriggers, which look like mini skis, attached to his hands. To reach his goal of gold, Morii knew that the current generation sit-ski being used in the sport needed to be upgraded to shave precious time off his runs. 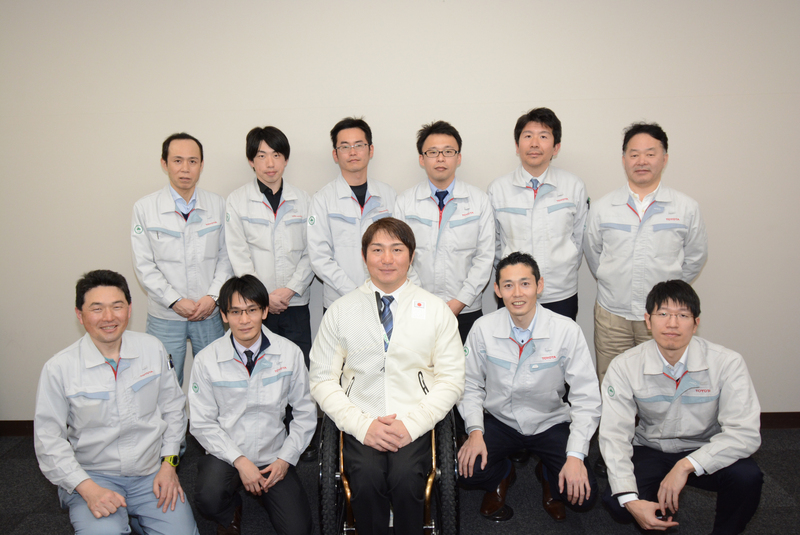 Enter “Team Morii,” a group of top engineers from Toyota Motor Corporation in partnership with Nissin Medical Industries who have been contributing to the development of a new sit-ski. “In sports competitions every second counts and milliseconds can be the difference between first and third. Closely collaborating with my colleagues as well as the talented engineers at Nissin Medical Industries provided an opportunity to make an improved sit-ski, applying many of the same principles Toyota uses in making cars, such as how to improve balance and power,” said Morii. The project to make an even better sit-ski was born from the efforts of a team of more than 40 engineers over a two-year period. Together, they formed “Team Morii” and focused on refining the frame rigidity, enhancing the link mechanism, and improving the aerodynamics of the sit-ski using best practices gleaned at least in part from their deep knowledge of automotive design and engineering. The journey to make the upgraded sit-ski came from a parallel drawn by the team between sit-skiing and automotive racing, including research and development which required testing at a number of different locations and situations. One site was Sugadaira Kogen, a mountain ski resort near Nagano. On the mountain, Morii was hooked up as a model to various computer aided engineering (CAE) devices to pinpoint form factor changes while skiing, hoping to shave critical time off each run. Next, in the Shoken, Inc. wind tunnel experiment room designed to test the aerodynamics of car design, engineers measured Morii in fourteen different positions to determine the most aerodynamic technique for a sit-skier and the ideal shape for a sit-ski. The team also took him to Fuji Speedway, where Morii took several laps with renowned racing driver and Ambassador of Toyota Gazoo Racing, Juichi Wakisaka. Through these various testing environments and experiences, the team was able to collect critical data and Morii was able to gain a different perspective of his sport, as well as insights into how to continue improving things for the ideal sit-ski. The sit-ski made by “Team Morii” has indeed improved thanks to the use of shared knowledge, such as chassis production engineering and CAE parsing technique for automobiles. The results? A new concept sit-ski where a cowl has been added to cover the feet of the skier for better aerodynamics, the weight has been reduced by approximately 15 percent compared to four years ago, and the newly designed frame is approximately three times more rigid. But Toyota’s contribution to provide a barrier-free society and help people chase their dreams goes beyond Morii and creating a better sit-ski. In close alignment with the aims of its Worldwide Paralympic Partner sponsorship, International Olympic Committee sponsorship in the mobility category of The Olympic Partner program and “Start Your Impossible” global corporate initiative, Toyota provides technical support for many athletes across a range of disciplines. A good example of this is Andrea Eskau, a Para cross-country skiing and biathlon competitor from Germany, who will be competing on a carbon fiber ski sled developed by Toyota Motorsport GmbH in Cologne, Germany. The ski sled uses technology honed in Formula 1 and the Le Mans 24 races. Engineers managed to reduce the weight of the ski sled by more than 30% while retaining its strength. Andrea Eskau will compete with ski sled developed by Toyota Motorsport GmbH. Further, the company featured Canadian Paralympic alpine skier Lauren Woolstencroft in the debut “Start Your Impossible” campaign, “Good Odds”, which ran last month around the world during Super Bowl LII. For more information about Toyota’s worldwide partnership with The International Paralympic Committee and to learn more about the “Start Your Impossible” initiative, please visit www.mobilityforall.com. To see Morii and “Team Morii” in action during the design and development process, watch "The Evolution of Taiki Morii's Chair Ski".